Second, I’ve come lately to acknowledging the value of wisdom received through other religious traditions. I grew up in a very conservative Lutheran tradition that taught me that all religion outside a narrowly defined orthodox Christianity was not only misguided but was mistaken. With horrible eternal consequences. In that economy, what value could there be in poring over the sacred texts of other religions in an attempt to learn from them and to gain from the accumulated wisdom? The migration out of my own narrow box has been slow and gradual. After 9/11, I realized that I knew so very little about Islam. So I read Karen Armstrong’s little volume, The History of Islam. Almost 10 years into my ministry, as a member of the ministerial association in Naples, Florida, I got to know the local rabbi; believe it or not that was my first encounter with Judaism (unless you count the New Testament!). Somewhere in there came a conversation with a friend who had spent years in Hong Kong; she thought I might enjoy Jesus and Buddha, by Thich Nhat Hanh, so I read that one and a couple others of his. In my work with community organizing, I’ve developed relationships with several Muslim congregations and their leaders, but I’ve never spent much time talking theology with them or about the wisdom that flows from their tradition. Hindus? I haven’t a clue. So, over the years, I’ve come very gradually to appreciate the authenticity and truth in other religions and have established some good relationships with faithful people who live out their lives as God’s children in a different way. Still, delving into the unique wisdom that flows from the various religious streams has never been a passion for me. Mildly interesting, but not a passion. I have a hard enough time incorporating into my life the wisdom of my own tradition, much less that of others. Enter Joan Chittister. (Did I mention that I love Joan Chittister?) Several years ago, I picked up what at that time was her relatively new book, Welcome to the Wisdom of the World. 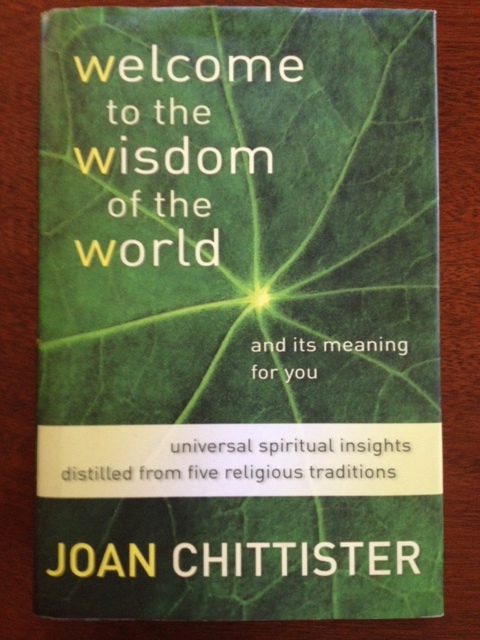 The subtitle reads, universal spiritual insights distilled from five religious traditions. That it sat on my shelf for a few years before I actually got around to reading it reinforces what I’ve already said, delving into what other religions have to say has not been a passion for me. Last month I finally read it. Am I ever glad I did. The premise of the book is to let the wisdom of five traditions — Hinduism, Buddhism, Judaism, Christianity, and Islam — speak to the fundamental questions and challenges of human life. She doesn’t deal with the wisdom of the religious traditions in a theoretical fashion, rattling off the main points of each tradition. Instead, she accumulates a long list of life’s persistent questions, and then lets a particular tradition speak to a particular question. Each chapter deals with a single question, and each chapter follows a standard format. Open with a story from someone whom Chittister has known in her long years of ministry; fashion some commentary that lets that real life story speak to the reader; tell a story from the sacred text or the oral tradition of that religion; make some comments anc come to a conclusion. The story and Chittister’s subsequent commentary on the story is where the real pay-off comes. That’s where the wisdom gets appropriated and opens up possibilities for how it might work for the reader. I have a hunch that this little volume will not be collecting dust. FIve religions; five chapters devoted to each religion, each dealing with a different question, and then five chapters of conclusion, summarizing the wisdom of each tradition. Feels a little like an introduction to world religion, except that the classroom turned out to be my own life. This entry was posted in Uncategorized on May 4, 2013 by Jim Honig. Thanks, Norm. I’ll keep that in mind. Now you’ve done it! I must now read the book to understand what you find compelling. This will be quite a departure from my normal reading repertoire. Thanks, Rodney (I think) 🙂 Hope you enjoy it. Let me know what you think! I can relate to your journey because we came from the same place. I was introduced to Joan about 10 years ago. The person I was closest to in the last few years at work was a very kind person of the muslim religion who was born in Iran. It is hard to hate when I can put a face with the issues of the day that divide my fellow Christians.